When Trying To Make A Point With Your Emails Or Blog Post Short Is Better Than Long. A wise man who looked at an email trail between me and my manager once remarked that both of us were misusing the concept of email as a medium. "You are way too long winded", he said, "that is not what email is all about. When you guys have written an email, you should reread it, ask yourself how you can say the same thing with fewer words, delete everything you have written and rewrite the same email this time with a lesser number of words". The idea was simple. When it comes to writing or reading content, that is supposed to make a point, short works better than long. 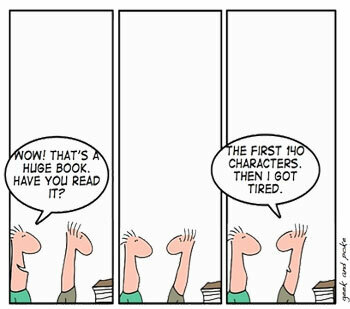 While with books the cartoon might seem funny, with emails most people scan your content anyway, and the longer it is the lesser the chances that they might actually read it. After all, people do not read email. They read me-mail. Years later the same feedback came in for my blog posts. A colleague of mine mildly hinted that I should practice writing shorter. Particularly since all my post revolved around a point which I was trying to make. Making the same point with lesser number of words, was an art, he believed I should start learning as soon as I possibly could. We're evolving as a race. Twitter imposes a hard limit of hundred and forty characters. Most other mediums are not as controlling and clear about how you aught to use them, but as a general rule, If you want to make a point, keep it short, keep it simple. If you have a story to tell or a book to write, go ahead and add verbiage. Describe your experiences to your heart's content. If it's humor your are trying your hand at, and you prefer not to use brevity, play with words all you want. There will always be cases where you need to flip those keys for hours but when it comes to an email or a blog post that is supposed to make a point, short is sweet, short is fun, short is powerful. Ok, done. I think I just made a point. That was short.